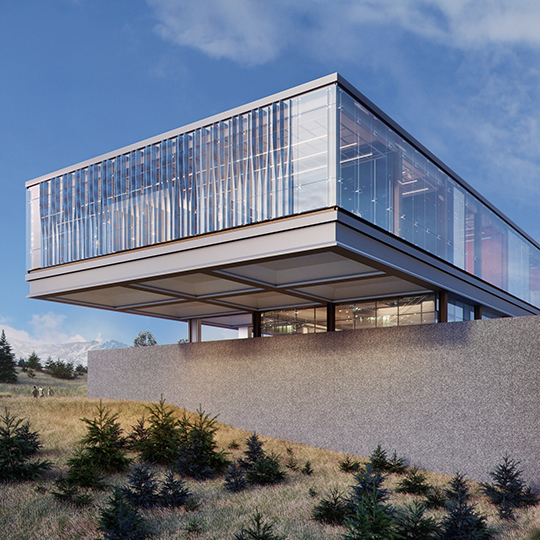 A new building at the U.S. Air Force Academy will help cadets and the Air Force prepare for cyber warfare. Through research, design sprints and real-world problem-solving, cadets at the Air Force Academy are preparing to be those defenders. Their training and education will increase exponentially once construction is complete on a new Center for Cyber Innovation. The new facility, to be built on the east edge of the cadet area overlooking Stillman Parade Field, will have a direct influence on the Air Force’s preparedness for cyber warfare. The United States Air Force Center for Cyber Innovation will bring together disparate groups at the academic and operational Air Force levels. On campus, all cyber-related programs will come together under one roof: Department of Computer and Cyber Sciences, its Academy Center for Cyberspace Research (ACCR), the Department of Homeland Security’s Center of Innovation and Air Force CyberWorx. Operationally, the center will attract industry partners and other cyber experts to create partnerships that will help address Air Force-related cyber issues. 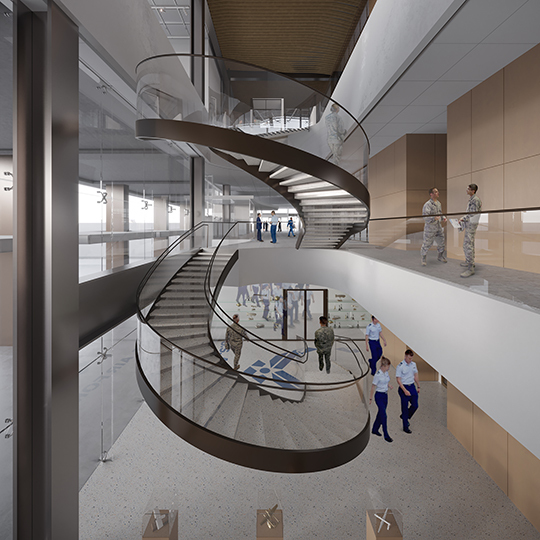 To help in this endeavor, the United States Air Force Academy Endowment has been charged with raising money to help outfit the building and ensure its ability to adapt to technological change. The Endowment will raise $45 million to build and equip the building. The federal government has allocated $30 million in military construction funding as well. As plans for the building and its associated programming move from concepts to reality, excitement among supporters has increased. In 2018, donors provided more than $11 million to help with construction costs for the building. With more than 75 identified naming and recognition opportunities, donors have begun providing support for areas that match their interests. An anonymous donor provided a lead gift of $8 million, the largest in the Academy’s history, in overall support for the project. Cubic Corporation has pledged an additional $1 million to name the lounge of the building. An Academy graduate and the Class of ’87 have focused on startup costs for two of the building’s 10 labs. Terry O’Donnell ’66 is funding the startup costs for the Industrial Control and Platform Security Lab, which will house the Academy’s Cyber City. The Class of ’87 is taking on the initial costs to outfit the Cyber Security, Networking, Radio Frequency and Telecommunications Lab. In addition, the Class of ’78 has identified the center as the focus for its 40th reunion class giving project. Each of the 10 labs has three levels of donor recognition, depending on whether the support pays for construction costs, assists with the startup costs to outfit the lab with equipment or endows future equipment needs. 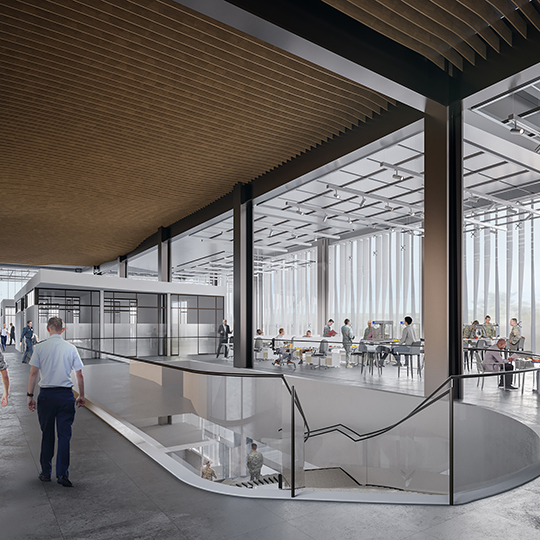 The building’s architect has created artist renderings to provide a look at how the Center for Cyber Innovation will fit into the Academy layout and to show what the interior should feel like when completed. Final drawings for the building exterior or for the interior layout have not been released. One important aspect the interior concepts capture is the collaborative activity that will occur throughout the center. Cadets, researchers, faculty and industry partners will collaborate extensively as they work through problems. The building features 31 breakout rooms, two collaborative areas and two design areas. These open and inviting spaces foster better cadet engagement, Caswell says. “That engagement is not just in the classroom but also in the research and design, also in design sprints, also with the partnership with industry. And that facility provides that ability to have this wonderful connection between both the commercial environment and the operational environment, so we can bring all the different players together to solve hard problems and to have cadets directly engaged in that solution space,” he said. The lessons cadets learn from all of the cyber partners involved with the center will prepare them for the continued cyber challenges faced by the Air Force during their officer careers. “The industry partnerships that we’re able to grow and develop here just continue to be hugely supportive of our program, and we look forward to that continuing in the future,” Caswell said. Read more about the Center for Cyber Innovation and giving opportunities online. The Center for Cyber Innovation will include 10 labs focused on a specific cyber area and a secure area. The labs will be used to conduct experiments and research and will often double as classrooms. This lab focuses on the attack and defense infrastructure, the technological backbone of American society. It would include physical or virtual industrial controls for systems such as the electrical power grid, water treatment plants, airspace control, traffic lighting, or police and emergency response networks. A realistic scale model of a town linked to these industrial controls — Cyber City — will provide an ideal platform for visually evaluating offensive and defensive actions involving these systems. This lab space will accommodate the weight, exhaust and power requirements necessary to run cyber activities against actual vehicles, both conventionally powered and electric. This lab will consist of computers on the private research network. Students and researchers will provide forensic examinations of computing devices and perform testing and analysis of software to conduct reverse engineering of potential malware. A future addition would provide specialized equipment to allow for hardware forensics. This lab’s immersive environment will allow for data analytics, experimentation, education, training and operations. It will feature 2-D, augmented, mixed and virtual reality visualization technologies coupled with data mining and analytical algorithms. Research will focus on improving the decision-making abilities of Air Force personnel. Students and researchers will be able to integrate the control of Air Force Academy air, space and cyber capabilities through direct control of simple unmanned aerial systems, space/satellite operations (e.g., FalconSAT) and cyber platforms. Data from each source will be used for simulation, analysis and comprehensive understanding of integrated operations. As a war room, the lab will serve as the operating location for cyber exercises and competitions and will include a viewing room for VIP visits. This space will allow users to actively design, develop and operate robotic and autonomous systems. It will be large enough to provide for safe testing of these devices, including small, unmanned aircraft systems (e.g., quadcopters) and autonomous, ground-based robotics. Students will be able to explore the many layers of political, strategic, legal and ethical issues inherent in the cyber domain in this focused environment. Researchers will conduct ethnographic research in order to understand team/decisionmaker/OODA loop dynamics. The analysis of these scenarios, and the decisions that are made in response to them, will help shape the course of cyber law and strengthen the application of cyber policies for generations to come. The lab will include equipment for digital photography, 2-D and 3-D scanning, high-motion video, sound and motion capture for collaborative digital humanities research and projects. The space also will double as a small forum and broadcasting center for a speaker series on cyberspace and military innovation issues. Specific uses of this lab include evaluation of cellphone signals, Wi-Fi frequencies, unmanned aircraft systems, control frequencies and more. The lab will feature a fully configurable cybersecurity testing environment capable of small-scale physical and larger-scale virtual network simulations. Researchers will be able to test and analyze malware hidden in network traffic and conduct and evaluate tests on appropriate ranges of the frequency spectrum. These state-of-the-art labs will be the training sites for the Cadet Cyber Competition Team (serving 25 to 75 cadets) and the Summer Cyber Training Programs (serving more than 200 cadets each year). With these initiatives, the Air Force Academy will explore innovative ways to train personnel in both technical and social cyber activities, informing and improving the Academy and Air Force cyber education and training pipelines. The lab will focus on a competition-style, gamified, mastery-based and self-paced curriculum to find methods that improve learning and motivate lifelong learning. Two security managers will share this private office space, which also features an open design to support classified work. Faculty and cadets will be able to work with industry partners in this area.